This split pea soup is a bit of an experiment. And it’s not actually ready yet. So hopefully we’ll know by the end of the post if it’s a good one or not. I think that apple and smoked cheese should go really well together. Although past experiments have not worked well, I’m quietly confident about this one. Spoiler alert: Vegetarian Split Pea Soup with Apple and Smoked Cheese tastes great. I wanted to make a really tasty vegetarian soup. I was going to use Puy Lentils because they’re so high in protein. And then I noticed the split peas at the back of the cupboard and thought “oh yellow, yellow apples and cheese…”. Is it going to work with smoked cheese? That is the question. And to be honest I think what made me plump for the split peas is that they taste so good with smoky flavours. I really hope it does or this is going to make for a very out-of-place introduction to the recipe. But if it doesn’t work I’ve a mild and sweet goat’s cheese that I can use instead. I love goat’s cheese. And I find it easier to digest than cow’s. But I’ve tasted the smoked cheddar cheese (made with raw cow’s milk and vegetarian rennet) and it is mm… yummily good! Is the addition of cheese just about increasing the protein in this? I like cheese. More and more so the older I get. I really crave it. Maybe I need the calcium. I know people say that adults have issues absorbing calcium from dairy products. I’m not sure I fully believe that. Why am I craving cheese? OK. Yes. Partly the additon of cheese into this soup featuring legumes, is about increasing the amount of protein. Without the cheese the soup offers about 4g protein per serving. With the cheese it offers about 13g of protein per serving. That’s a pretty impressive increase, don’t you think? The thing about Puy Lentils is not only are they chock-full of protein they also cook in 40 minutes. Split peas take at least twice as long. But I think they’re going to taste best with the apple and smoked cheese. And they do!!! This tastes great! Well, hope you think so too. Split peas, carrots, onion, celery, cooking apple, pink lady apple, smoked cheddar cheese, thyme, seasoned salt mix. Forget the honey. I’m not using the honey. Peel and chop up the onion and carrot. Chop up the celery. Mix in the blender till you have a mince of the vegetables. Heat some oil and and a little butter in a deep pot. Add in the minced onion, carrot and celery. Sprinkle over a good pinch of salt the thyme. Leave to sweat for a few minutes on gentle-moderate heat. Peel and core the apples. Mince them in the blender and add into the pot. Rinse and drain the split peas in a sieve. Add into the pot with 1.5 litres of water or stock. Bring to boil. Let boil for 10 minutes and then reduce to a simmer. Cover and leave until the peas are soft. May take a good 1.5 hours. If it needs more liquid add in some water but be sure to add in more seasoning too if needed. When the peas are soft enough, remove the pot from the heat. Let it cool for a minute or two before using a hand blender to blend to a smoothish consistency. Stir in four-fifths of the grated cheese. Serve with a thin slice or two of sweet apple and some grated smoked cheese. Chop up the apple in the blender. It’s quick. And it works fine added to soup early. Check it every so often to see if you need to add more liquid. 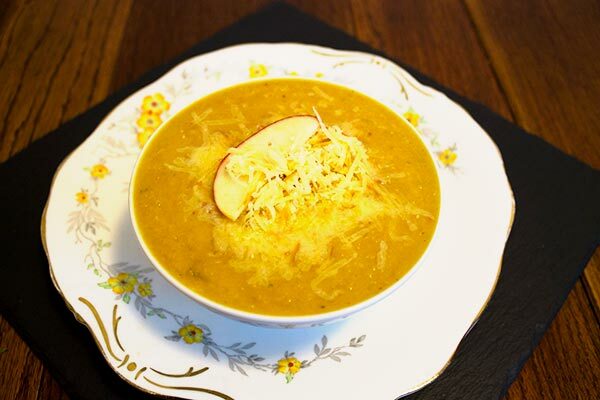 A bowl of vegetarian split pea soup with apple and smoked cheese.